The toy at the top of a list of fun products fondly remembered from childhood is not a toy at all: it's a mallet. 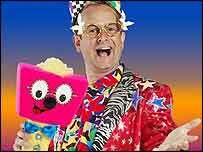 The blow-up weapon wielded by children's entertainer Timmy Mallet carried off 36% of the 20,000 online votes of toys people would most like to see back on sale. It was a surprise to toy shop chain The Entertainer which ran the survey, but it was representative of the overwhelming theme of the favourite toys - television shows from the 1980s. Also on the list were the Centurions, Garfield, Thundercats and Ghostbusters. The company says the list perhaps reflects the late 20s, early 30s, age group of internet users. However, in at number six were The Woodentops, characters from the 1950s. "That was very interesting because there were no toys made with the series when it first came out," said Barry Eldridge, The Entertainer's communications manager. "When people say they remember playing with them, it was probably ones they made themselves." The list of toys from yesteryear follows a trend for nostalgia in toy shops. This year alone has seen the re-release for My Little Pony, Care Bears and the Teenage Mutant Ninja Turtles - and they are flying off the shelves. The marketing men's thinking behind their comeback seems to have paid off. The toys had their heyday 20 years ago and now the little boys and girls who played with them have children of their own. "There's parental nostalgia with mums and dads wanting their children to play with the same toys they had," said Mr Eldridge. "And there are adult collectable editions. People know toys in mint condition are worth money. We have mothers coming in and buying two of a toy - one for their child and one for the loft. "Antiques Roadshow in 30 years will be full of them." Last week the British Association of Toy Retailers predicted The Teenage Mutant Ninja Turtles will be a Christmas bestseller this year. Not all the favourite toys were from television series. There were a lot of requests for the return of a cardboard Death Star from Star Wars and the classic Fisher Price record player with plastic records. What is your favourite toy? Which childhood favourites do you think should make a come back in the shops? Let us know by filling in the postform below. 'Crossfire' - it's still around I think, but they've messed it about - typical! You had to put a plaster on your trigger finger to prevent severe blisters. 'Super Flight Deck' - you shot a Phantom jet up a wire (using a rubber band launcher) which was attached to some suitable high point. The plane turned round and you had to 'land' it back on deck when it came back down the wire. Excellent fun - from what I can remember. Anything but those ridiculous spring mounted antennae - Deely boppers! The spud man. Hours of fun at minimal cost. Even had the option of losing his body and replacing with a live vegetable.... utter genius! Mr Potato Head rules. MB Big Trak (but only with the trailer). I had loads of different toys when I was younger, Teenage Mutant Ninja Turtles, Mask and He-Man to name just a few, but my favourite was Transformers the characters and stories were captivating and the toys were fantastic to play with. My school friends and I had some fantastic Autobots Vs Decepticon battles. Transformers have got to be worthy of a comeback above any other toys. I may just buy He-man and Battle Cat! I can't believe He-man never got on that list but She-Ra did, as the Horde (She-Ra's bad guys) were rubbish. However all that has changed with the release of the new series which has several nods and winks to the old series (watch the intro and listen to Prince Adam and you will understand). Of course, a new set of action figures are now being realised, I may just buy He-man and Battle Cat! I have many fond memories of me and my Care Bears. My favourite - Grumpy Bear, of course. But already, I've noticed that the Care Bears are making a strong come back. It has to be the A-team toys, I used to love those, or M.A.S.K, they just haven't got anything as cool as those as far for toys for boys. The new Action Man just doesn't cut the cheese in comparison! Transformers were a big childhood favourite. They were the best selling Christmas toy in 1984 and 1985. Without doubt He-Man with Castle Grey Skull and Snake Mountain fortresses and Battle Cat and Man at Arms figures. Close second was Transformers - Optimus Prime, Megatorn, Hot Rod/Rodimus Prime, Galvatron, Blur and the rest of the gang. Star Wars Death Star play set. Christmas 1973: The overwhelming scent of new plastic and a beautiful orange Spacehopper under the tree, someone must have got a job-lot cheap because every kid on the street had one, we all had our names written on them to stop any future arguments. Best toy ever! In my opinion, the Lego sets from the 70s, 80s and early 90s are the best toys ever created. Unlike most of the toys mentioned in the article, which are really just cheap plastic gimmicks, traditional Lego bricks help children develop skills and creativity. I only ever asked for Lego for Christmas and birthdays as a child in the 80s and 90s. 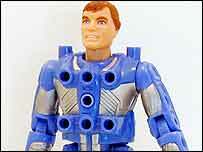 Most other toys were very limited and poor quality in comparison. My favourite toys where; trees, ditches, crab apples and all those things you could enjoy outside with your mates. Manufactured toys were for rainy days, except maybe a spud gun. Spud guns were ace! I think they should bring back Cabbage Patch Dolls! They may be ugly and unhumanlike but I think they are sweet. I still have one that I had when I was two. They're much better than the dolls today because it wasn't electronic so you had to use your imagination when you played. I loved Mercano. I used to spend hours with it.